This simple guide helps you polar align your Celestron equatorial mount when you have no view of the north star. An eye piece with an illuminated crosshair, or attached camera with software that will put a crosshair on the display. Astro Locator, for GPS, Time, Compass, and Altitude. Sky Safari 6, in 'Night' and 'Compass' mode. The first thing you’ll need to do is set up your mount on level ground facing roughly north. Make sure you use a bubble level to ensure your mount is on a flat plane so that when it’s rotating around it’s azimuth the mount is not moving up and down slightly. It’s important you’re facing north within a few degrees, you can achieve this by using your phone’s compass feature (or Astro Locator) and laying it across the main telescope tube on a flat surface. You’ll want the phones settings set to face true north. This is already established in Astro Locator. Turn on your mount, and plug in your home site settings or let your GPS system update your time and location in the mount’s hand controller. I currently use a GPS, but prior to that I would watch the clock in Astro Locator, and set the time setting down to the second for accuracy. Use your mount’s hand controller to select 2-star alignment. It’s going to show you the name of a suggested star in the western hemisphere that it thinks is visible in your location. Since your mount is pointed roughly north, west is going to be anything directly to the left of your mount, and east will be anything directly right of your mount. The star it suggests might not be visible to you depending on your location and any objects that might be in the way (like houses or trees). This is where Sky Safari comes in handy. I open it up on the iPhone, zoom out so that I can see a fairly large portion of the sky, and press compass (one of the buttons on the bottom of the app). 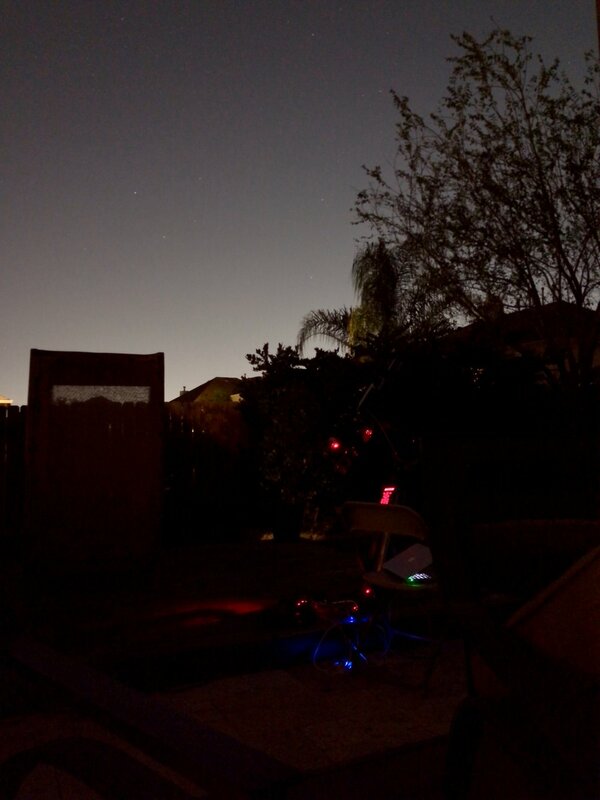 This allows you to pan your phone around the sky, and look for stars that you can actually see. Typically, the named stars in Sky Safari, are only the brightest stars, and you should now be able to visually identify stars in your night sky. Look for a bright star to the left of your mount, and correlate it to a named star in Sky Safari. Once you have a star picked out, use the up and down arrows on your telescope’s hand control to scroll alphabetically through the list of named stars until you find the one you’re looking at. Press enter on the hand set and the mount will now move to the first star. If you’ve set the time, location, and position of your mount properly, you should now see the star within the mount’s field of view either through your finder scope, eyepiece, or camera video. (TIP: Here’s a shortcut to improve the initial setup. Once you’ve aimed at your first star, but before aligning it in the crosshairs with the hand controller, use your mounts manual azimuth and altitude adjustments (the physical knobs) to move the star inside the crosshairs. Once done, you can then use the hand control to align the star, and you will not need to use the arrow keys to move the mount around in this step. All this does is improve the GOTO of the alignment stars during this alignment process. Using the mount’s hand control, follow the directions on screen to center the star in your crosshairs. Accuracy is important here. You want to get the star as centered as possible. Press ‘align’, and then a suggestion for star two should show up. Repeat the process for a second star in the western hemisphere. Find a second visible star using Sky Safari, then select the name in the mount’s hand controller to move to that star and align it centered in your crosshairs. You will now be prompted to add up to 4 additional calibration stars from the mount’s hand controller. These will all be in the eastern hemisphere, and you’ll want to continue repeating the process for all four of these stars. Your telescope now has a an accurate GOTO pointing model stored in it’s system for your specific night sky. The 2+4 alignment process you just finished is not the polar alignment, but the pointing model for the GOTO system. For visual observers you’re set now, and can stop following the tutorial here. If you intend to do imaging, the next steps will cover the polar alignment process to dial in that last bit of precision for long exposure imaging. Press ‘Align’ on the hand controller, and use the arrow keys to select ‘Polar Align’. Use the scroll arrow keys to move to and select ‘display align’. This will show you (with a reasonable degree of accuracy) how close you are aligned to polar north. An error less than 00 10’ 00’’ is fairly good, but you want to get as close to 00 00’ 00” as possible, especially if your telescope is a long focal length or you expect to use really long exposures. Now use the back button, and select Align under Polar Align. You’ll be asked to align your mount to the last star you were pointing at. If this star does not match the criteria required for Polar Alignment, you’ll get an error message saying this star isn’t appropriate, and to pick another star. If you get that error, you need to back out of the Polar Align menu to the home screen where it says ‘ready’, select ‘Stars’ on the hand control, and scroll to ‘Named Stars’. Using Sky Safari, you need to locate a bright star near the horizon, as close to north as you can find, then select it in the hand controller and move the mount to that star. Now, press ‘back’ on the hand controller to get you back to the controller home screen, select ‘align’, ‘polar align’ and this will now start the polar alignment process. The scope will now goto the star you’re already pointing at, and it will ask you to center it in your crosshairs. Once you’ve pressed align, it’s going to move once more to that same star, but this time you’ll see it’s not centered again, the scope is now pointing to where it thinks the star should be if your mount is perfectly aligned. The hand controller is going to ask you to now use your manual altitude and azimuth physical mount knobs to re-center the star. Once complete, you’ll press ‘Align’ again. Select ‘Display Align’ to check how close to 00 00’ 00” you are now. Assuming you are at 0 or even a few arc seconds of error, you are close enough to 0 to move on to setting up your guiding software and pick your first target of the evening. If you want to try getting to 0 error, you can repeat the polar alignment part of this process.